CONTENT WARNING - You know the drill...this is Junco we're talking about, right? Bad language, no qualms about killing. Junco exploded onto the scene in Clutch and she hasn't stopped yet! J.A. Huss brings back her wild, foul-mouthed heroine with another fierce installment in the I Am Just Junco series: Flight. Junco survived the fledge with a devastating victory and found a most shocking way to save her beloved Tier. What's interesting about Flight is how much further and deeper we're privy to Junco's childhood. 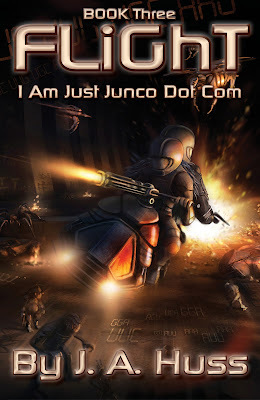 All the stories up to this point have shown us bits and pieces of what led Junco to this point in time, but this time Huss took it a step further. Not only do we see who was involved in her childhood, but we see how the prophecy of the Seven Siblings tied in with how she was raised to be a killer. The first novel of the series basically outlined the Seven Siblings prophecy, but honestly I couldn't quite picture what the future of the series held. Huss does and excellent job of clearing up any confusion by adding details and finally moving forward in it's fulfillment. The 039, the team of Avian warriors including Junco and Tier, are leading a mission with rebels on Earth to rescue the other four siblings still in captivity. The discoveries of Flight are shocking, a little creepy, but so perfect for this novel filled to the brim with elements of science-fiction. Even with this important mission, that could change the world with its success or failure, Huss manages to combine action and strategy while leaving room for drama and heartbreak. Junco's friendships deepen and separate while new bonds are formed. The end of the novel is probably my favorite part, actually. Not because I was happy the story finally ended, but because it ended with a shocking twist involving Lucan. This mysterious character who stays on the sidelines until very prominent moments, Lucan shows himself as a vital part of readers and Junco finally understanding the prophecy.